Auto-cast Claw/Bite/Smack Fixed in the Patch? Pets will now correctly auto-cast Bite, Claw, and Smack again. Blink Strike' teleportation will no longer work for pets that have been rooted. Beast Cleave damage against nearby targets will no longer be affected by damage taken modifiers on the primary target. Sure Blink Strikes being a way around a rooted pet is a bummer for PvPers I guess .. but it shouldn't be working. Regarding Beast Cleave damage, I'll have to see how it looks. I often am using a boar (named Bacon of course) so I was benefiting from that and not realizing it. Yes, clearly it shouldn't benefit that way, but I'll have to see how the damage pans out. But Hallelujah! Standard Attacks working from auto-cast. If I can clean up my macros, I'll love it. Sadly, to test auto-casts out in ToT, I'll need to do some LFR as we killed Lei Shen last night. UPDATE: I removed all the "/use claw" type commands from my macros. 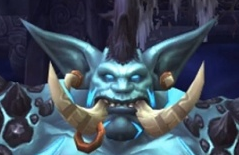 From LFR log parses without those macro'd, it looks like Claw, Smack, and Bite are fixed. I'm not entirely sure they are doing as many attacks as they otherwise could. But that might be old news. I did have some pet glitching where the pet stood beside me when he was on assist but just did a petattack to get him going. Some bosses don't want to let pet auto-casts fire off Standard Attacks. I've added a bunch of Claw and Bites into my existing macros and I made some additional ones to deal with this. I didn't add in Smack but I probably should! Strangely, I've seen Smack work but it still could be boss-specific. They can be hit manually or put into macros. This bug is independent of talent choice or exotic vs normal pet choice. The problem started with 5.3 and is probably related to changes to accommodate Blink Strikes mechanics. As part of this macro dump you may see some other gems you would like to incorporate into your play. I still very much want the auto-cast bug to be fixed. These macros can still result in a lot of noise about the pet not having enough focus unless properly squelched. I've also left a lot of the cruft in there. Note one: Make sure to name the macro "AoE Talents" and hit it to change the icon and tooltip after you change a talent or switch specs. Note two: hat tip to a post by Laeleiwyn. I just added some rails. Note one: See above, but name the macro "DpsT". Note two: Pull out Blink Strike as it doesn't exist ... and put in something else ... certainly not Blink Strikes as it's a passive. Note: Boost that Beast Cleave AoE with a +20% damage buff and resulting Beast Within for cheaper multishots! Note: yes, you could just use the one above! Note: I have this on my #3 key, but I also have Black Arrow on my F3 key as I generally just use it for a double-tap opener. I refresh BA without hitting this. Note one: I should pull out that use command, but if you have anything to use, slap it in there. Note two: this reminds me that I should find space to add in a clear() into the other macros if the pet auto-cast bug is here to stay. I don't have scientific data to understand exactly what is going on here. But I do see that Frenzy buffs are not happening hardly at all. I did Durumu Normal 10man last night (5.3) and on Monday (5.2). I always try to do it as BM. I went from 66 frenzy stacks in 5.2 to SEVEN frenzy stacks in 5.3. Details below. On Monday my pet had 163 melee attacks and 72 bite attacks. I was using a boar. The fight lasted 8m39sec. This resulted in 66 frenzy buffs with a total uptime of 89.3%. I hit focus fire 10 times and got 270 focus total. This is pretty good. Last night, my pet had 155 melee attacks and only 8 claw attacks. I was using a spirit beast. The fight lasted 7m27sec. This resulted in only 7 frenzy buffs with a total uptime of 13.6%. One time I saw it stack to two and hit focus fire (once) and got back 12 focus. Once. Yes, I had a few variables different in the fight. Different pet. Different raid (3 heals vs 2 heals). But both pets had full autocasts on except for Growl. I had the same talent choices. aMoCs and Glaive Toss. So no Dire Beast(s) talents were in play. I also spent 3k valor on upgrading gear. I reforged and stayed hit and expertise capped. I've added to a Blizzard bug thread on the issue. Check your logs! For one day (which I happened to be raiding!) the Legendary Gem was stealth-hotfix-nerfed to 1/3rd it's damage. Supposedly. I was considering tossing it away for a normal meta. But I didn't. And the hotfix got rolled back. 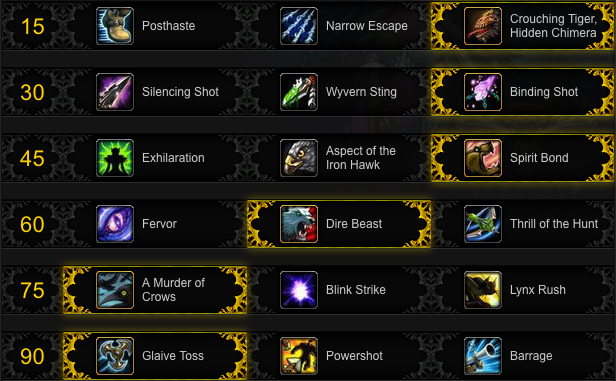 In MoP 5.2, we have one big AoE choice with a few small variations. You run as a Survival Hunter. You lay down Multishots and get Serpent Spread. You drop an Explosive Trap. If you're rigged for AoE, you run with Thrill of the Hunt and slam those multishots in and toss in Barrage fire. You also toss in free LnL ExShot procs. If you are BM you do what you can, but you don't see the enemy health bars drop very fast. It is very likely that BM will have it's AoE buffed in MoP 5.3. The big buff is coming from an increase to Beast Cleave damage. It's going from a +30% to a +75% damage application. This isn't going to require BM to have special builds to better AoE. But you will want to do things a little better to maximize your AoE damage. Beast Cleave is a buff put on your pet that is short lived. Have a timer bar to see that buff duration! I recommend a NeedToKnow. Don't let the buff drop! Multi-shot starts the buff. Ensure that you have enough focus to multi-shot again so you can keep the buff up on your pet. Make sure to have your pet in range of the AoE mobs! The redesigned Blink Strikes may help squeak out a bit less travel time. If you read the tooltips, Beast Cleave's damage makes the " pet's melee attacks also strike all other nearby enemy targets for 30% as much". Soon that will be 75%. So I currently pop Bestial Wrath to boost the pet damage by +20%. DISCLAIMER: I don't know if this is applied only once to the pet's melee attacks or if it double-dips and is applied to the melee attacks and the bonus cleave attacks, or if it is applied to neither. I've looked but only spent about twenty minutes trying to determine the benefit or non. I'll need to be much more scientific and do it without any equipment that can proc with a nice quiet target dummy cluster. In addition to macroing in Bestial Wrath with my BM's MultiShot, I also have it engage the enemy, send in my pet so it doesn't want to smack something else for a second or two, and kick off Rabid if it's off CD. I also have it not complain noisily. What Else Can BM Do for AoE? Remember to drop the explosive trap. Line up a nice barrage or glaive attack. If you have a DPS worm, you might experiment with burrow. Use Focus Fire conservatively as it drains your pet's Frenzy stacks. 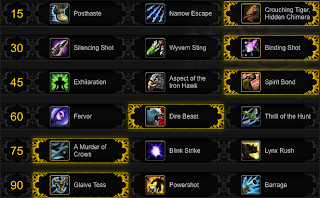 Recommended talents for battling Jin'rokh. You may choose to use Lynx Rush instead of aMoCs. Any level 30 talent may be taken because none have any applicability. Fervor is a reasonable choice if you want to gain focus for more Kill Commands, but Dire Beast is a nice attack. Thrill of the Hunt is always wasted on melee hunters. As far as weapon selection, I recommend you further shame Jin'rokh by not using a very good melee weapon. In this regard there are a few options. First, you could wield a profession oriented item or something more exotic. This might not pack enough oomph and the line or brew may not be suitably strong enough to land the boss. I have vendored all my polearms, so my personal choice is to dual-wield two pumpkin swords. Thank goodness we can still dual-wield melee weapons! Make sure to out-dps the rogue and demand to roll on the obvious upgrade to celebrate in a purple euphoric haze. If you happen to be a ranged hunter then you can use whatever specialization, talents, and glyphs you want and you'll do fine. You could also decide to equip a ranged weapon and attack outside of melee, but use your discretion.